A Tunisian graduate whose attempted suicide set off violent protests over unemployment across the North Africa nation has died. Mohammed Bouazizi, 26, sold fruit and vegetables illegally in Sidi Bouzid because he could not find a job. Last month he doused himself in petrol and set himself alight when police confiscated his produce because he did not have the necessary permit. Public protests are rare in Tunisia and dissent is usually repressed. But recent economic discontent has provoked the most violent unrest in more than a decade. 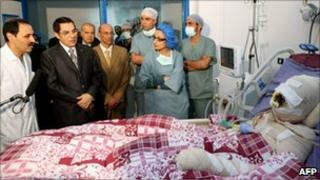 Mr Bouazizi died on Tuesday afternoon in a hospital outside the capital, Tunis. A crowd estimated at around 5,000 took part on Wednesday in his funeral procession to a cemetery near Sidi Bouzid, union official Kamel Laabidi said. He told AFP news agency that the marchers chanted: "Farewell, Mohammed, we will avenge you. We weep for you today, we will make those who caused your death weep." A massive police presence prevented the crowd from reaching the governor's office, outside which Mr Bouazizi had set himself alight, his uncle, Mehdi Horchani, told AFP. "Mohammed gave his life to draw attention to his condition and that of his brothers," Mr Horchani, said. President Zine al-Abidine Ben Ali, who has ruled Tunisia for 23 years, condemned the riots, in which at least one demonstrator died when the security forces opened fire. Officials say the officers retaliated in the central town of Menzel Bouzaiene after coming under attack with Molotov cocktails thrown by the crowd. The government said the demonstrations, which then spread to the capital, were exploited by the opposition. But the president, who visited Mr Bouazizi in hospital before his death, said that he would seek to find a solution to the problem of unemployment - and has since appointed a new youth minister.